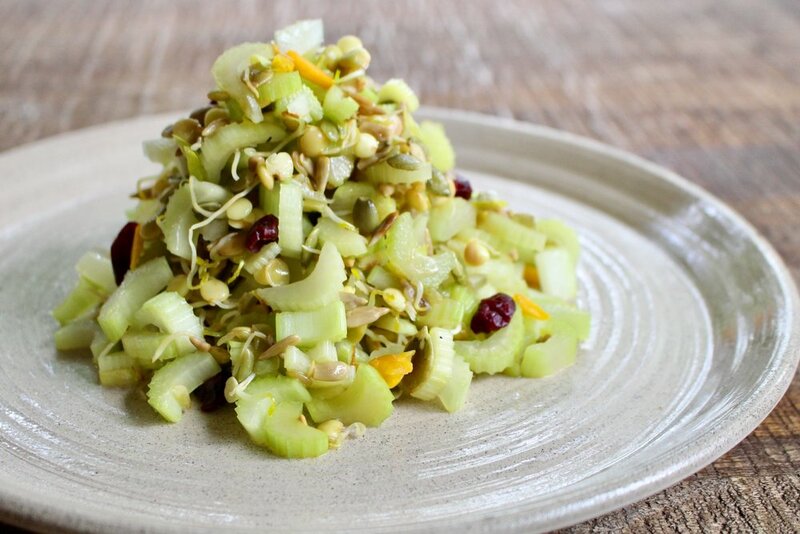 Celery salad is a great summer dish. It is a wonderful dish to bring with you to a potluck dinner. It is light, refreshing, inespensive and crunchy. It is sweet, salty, and tangy. I'm not a big celery fan, but this salad is my new fav. Celery known for it's low calorie content as well as a good antioxidants source, along with vitamins and minerals, such as K, C, B6, potassium, and folate. Studies shows that celery can protect from cancer, lower cholesterol and help prevent urinary tract infection, as well as boost digestion and great for weight loss. I love to eat food that is guilt free, and contain endless health benefits, this is one good example. Especially in the summer time when it's hot outside and all I crave is light and refreshing food that I can make ahead of time. You can prepare the salad for lunch even the day before, it will stay nice and crunchy.